nt GSE mortgages in recent years, however, these fears are not well founded. Fannie Mae and Freddie Mac (the GSEs), the guarantors of most of the nation’s mortgage debt, currently only purchase loans that have at least a 5 percent down payment. Prior to late 2013, however, Fannie Mae guaranteed loans with down payments between 3 and 5 percent. By examining the performance of these pre-2013 loans, we can get a sense of how likely it is that borrowers with similar loans will default going forward. The default rates of 3-5 and 5-10 percent-down payment GSE loans are similar. Loans that originated in recent years with down payments between 3-5 percent exhibit default rates similar to the default rates of those with slightly larger down payments—in the 90-95 LTV category. Of loans that originated in 2011 with a down payment between 3-5 percent, only 0.4 percent of borrowers have defaulted. For loans with slightly larger down payments—between 5-10 percent—the default rate was exactly the same. The story is similar for loans made in 2012, with 0.2 percent in the 3-5 percent down-payment group defaulting, versus 0.1 percent of loans in the 5-10 percent down-payment group. While this database is limited to 30-year, fixed-rate, amortizing mortgages (interest-only mortgages, 40-year mortgages, and negative-amortization loans are excluded), it is representative of GSE loans made in the post-crises period. Borrower’s credit is a stronger indicator of default risk than down payment size with these loans. The pattern is consistent even in the years leading up to the crisis, when overall default rates were much higher. In 2007, the worst issue year, 95-97 LTV loans in any given FICO bucket performed only marginally worse than the 90-95 LTV loans, and FICO score was a larger determinant of performance. For example, 95-97 LTV loans with a 700-750 FICO score have a default rate of 21.3 percent, versus 18.2 percent for 90-95 LTV loans. However, the 95-97 LTV loans with a FICO score above 750 had a 13.5 percent default rate, much lower than the 90-95 LTV loans with a 700-750 FICO score. The GSEs' risk-based pricing means only a small group of lower-risk borrowers will end up with these loans. This analysis tells us that there is likely to be minimal impact on default rates as low-down payment GSE lending gravitates towards borrowers with otherwise strong credit profiles. And this makes sense because GSE loans are priced on the basis of risk (including loan-level pricing adjustment and mortgage insurance costs), while Federal Housing Authority (FHA) loans are not. Thus, borrowers with high LTVs and low FICO scores will find it more economically favorable to obtain an FHA loan. Furthermore, in recent years, a miniscule number of these loans were put back by Fannie Mae following a default, an action taken when Fannie determines that a delinquent loan was irresponsibly underwritten. The number of putbacks on 95-97 LTV loans over the entire 1999-2013 period was 0.5 percent, little different than the 0.4 percent for the 90-95 LTV bucket. Those who have criticized low-down payment lending as excessively risky should know that if the past is a guide, only a narrow group of borrowers will receive these loans, and the overall impact on default rates is likely to be negligible. This low down payment lending was never more than 3.5 percent of the Fannie Mae book of business, and in recent years, had been even less. If executed carefully, this constitutes a small step forward in opening the credit box—one that safely, but only incrementally, expands the pool of who can qualify for a mortgage. This is nonsense. One of the basic principles of lending is CAPITAL (one of the 3 or 5 C's of credit, depending on which credit shool you went to). In this case, it is capital at risk in the form of down payment. The more capital a borrower has at risk, the harder the borrower will work to protect it. Stop disguising social policy for sound credit selection. It is fine to make lower down payment loans, but the loss given default warrants greater pricing (risk premiums) than regulations allow. Let's de-regulate the market and lenders will be drawn into it if they see appriopriate returns. But wouldn't default rates for low downpayment loans be dependent on the recent and expected direction of house prices (i.e., depreciation => higher default rates and vice versa)? 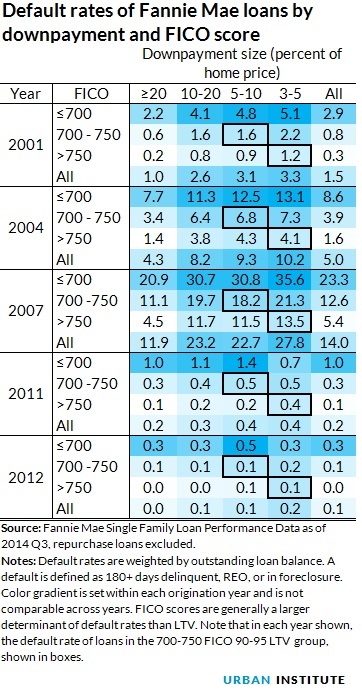 If I read the table correctly, 2007's high default rates bear that hypothesis out. I don't think we should ignore the "jingle mail" effect. By focusing on 2011 and 2012 originations you risk painting too rosy a picture of high leverage loans. I totally agree. It has to do with the applicant's credit payment history, not the down payment. I obtained my first loan with a 5% down in the 80's. Allowing a lower down payment will trigger and/or boost the real estate/mortgage industry. Everything is associated with real estate. It impacts almost all businesses; from furnitures to appliances, name it. "In other words, low underwriting standards — especially low down payments — drive housing prices up, making them less affordable for low- and moderate-income buyers, while also inducing would-be homeowners to take more risk." I think the most telling statistic here isn't the default rate vis-a-vis down payment or credit score, but the overall default rate which is virtually nil. This indicates lenders are taking NO risk, or fear buybacks so much that they only make loans to people who have no risk of default. I agree with the Institute's point that measured risk based on actual data should drive policy. The Institute's mission take's issue with long held beliefs which have no basis in fact. Those who say that a large down payment is the only way to offset underwriting risk don't understand the way people leverage themselves to obtain a large downpayment when there are no alternatives. I have seen a large proportion of 20% down payment loans that have defaulted, where the borrower obtained the down payment funds through hidden alternative financing, consumer debts, leveraging retirement accounts and other methods which drove the true cost of credit way up. This disguised financing prevents the underwriter from making a real analysis of the borrower's situation. Old-timers who argue for a standard of a 20% down-payment loan need to get their heads out of the sand-trap. The statistics accompanying this article DO NOT show the same default rates. The 5-10% downpayment default rates are significantly lower in nearly every category. And what is not shown is that in the event of a default, the amount of money lost by the GSE is higher when the buyer put down a smaller downpayment. Smaller downpayments = larger loans and less equity. The lower the downpayment, the riskier the loan. Always.